Note: Please have the latest version of Maven 3 installed. 1. In your feature folder, add an empty sourceTemplateFeature folder to tell Tycho to generate sources for the feature. If you use git, place an empty .gitkeep file in there to ensure the folder will be checked out. 3. For each plugin contained in the feature, ensure its build.properties contains these lines (or similar). Your plugin MUST include a src/ folder. To package source with Tycho, you need first need a feature that contains the source plug-ins. Then in any plug-ins that you reference, you need to ensure their respective pom.xml contains a reference to the tycho-source-plugin maven plug-in. Update Site repositories simply reference the parent pom and have a packaging attribute of eclipse-update-site. p2 Repositories simply reference the parent pom and have a packaging attribute of eclipse-repository. The project must also include a category.xml if you want to publish features or a myProduct.product if you want to publish a product. I didn't get a chance to adapt my orion experiment to minerva yet, but here is the pom.xml and category.xml. Headless tests simply reference the parent pom and have a packaging attribute of eclipse-test-plugin. Tycho does all the hard work and finds the tests to run as part of the build. UI tests simply reference the parent pom and have a packaging attribute of eclipse-test-plugin. In this case, we use the built in support in Tycho to launch an Eclipse to test the UI. We also ensure any features are installed that we need (like our minerva feature). You can use code coverage by adding the proper maven plug-in dependencies in the parent pom.xml. In this example, we're using the findbugs-maven-plugin and maven-pmd-plugin maven plug-ins. Then, to enable code coverage for each plug-in you have to update their respective pom.xml. and then you can simply run a ***mvn sonar:sonar*** after your build to push reports to Sonar. Jacoco is the future of the Emma and EclEmma projects and allows to produce code coverage simply by setting a java.agent VM argument and without need to provide an instrumentated version of compile code. Then it does not require additional work, and a Jacoco Maven plugin is available to make configuration easier. Then all your children tests modules will inherit from this extension and they'll automatically have test coverage enabled. If you release your code at eclipse.org, you should get it signed. There's a /usr/bin/sign binary on build.eclipse.org that you feed a zip file containing your binaries. Signing is a bit complicated on hudson.eclipse.org and if your using tycho requires the usage of a special maven plugin. The process the maven plugin goes through is comprised of 4 mojo's and the leveraging of a bit of ant with the ant-maven-plugin. pack - run the pack operation from the embedded eclipse equinox packing tool which itself is a wrapper over the pack tooling in the jdk. For jetty we deploy the site to a static development repository under the typical p2 repository setup and when we want to release it public we copy the development directory to a named directory for the version and then update the p2 aggregate artifact and component xml files. This is what I use to deploy a p2 repository someplace to test from before manually making active. There's a hudson instance that's available for eclipse.org committers. To run your Tycho build in Hudson, it's very easy. 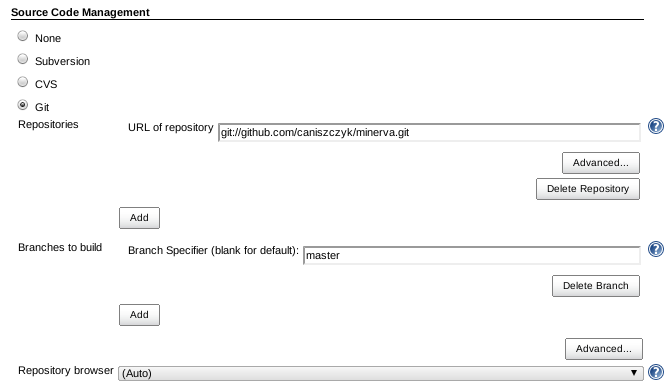 The first step is to select the correct Git repository to fetch from. The next step is to setup the right Maven goals to run. The final step is to ensure we publish our repository artifacts when done. That's it, you should see the latest successful artifacts after the build is complete. The script essentially grabs the latest succeessful build from hudson and publishes it to a directory.